So this seem to be the Topic through the gaming communities everywhere so let me break it down a bit. 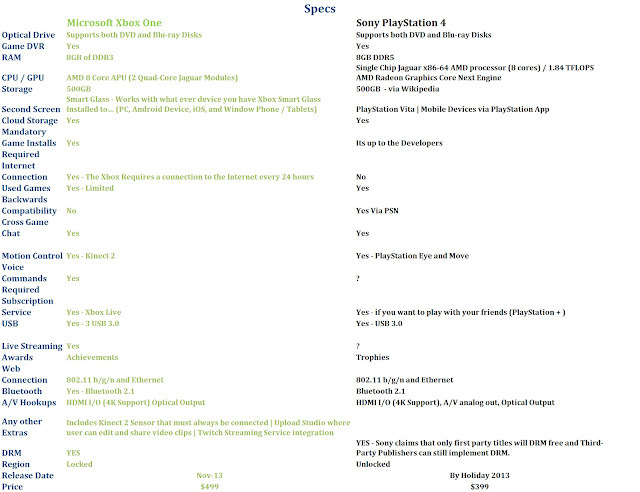 When it comes to Technical specs. the PS4 comes out on top but that doesn't necessarily mean much if the developers don't take advantage of it. The reason why i feel that the Xbox 360 did so well is not because of its technical specs because they lost that to PS3 but because it was an easier system to develop for (well that and Xbox Live online experience straight up shitted on PSN) . That is why most games that were multiplatform were developed on the Xbox 360 and ported to the other systems afterwards. Sony is saying that they made the PS4 easier to develop on but only time will tell, and if it is true Microsoft may be in trouble. Flat out both system are ugly but i have to say the PS4 is not as ugly. Microsoft returns to its big bulky design of the past. 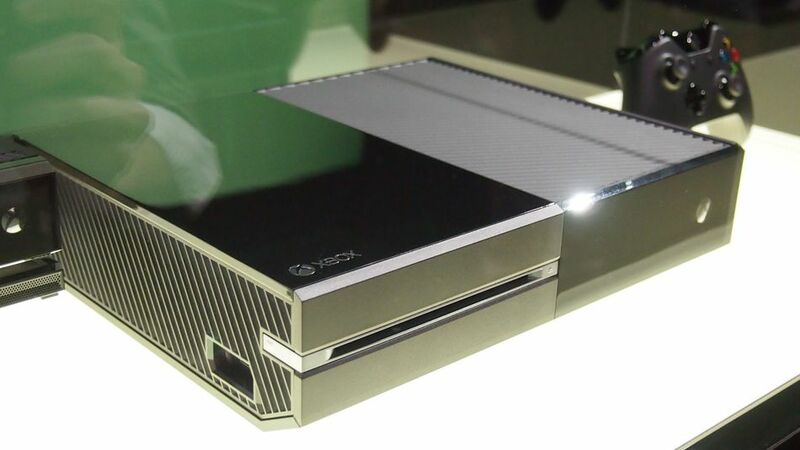 It looks similar to the redesigned Xbox 360 but bigger and no disk drive as it now uses a slot. The PlayStation 4 isn't much better as its is shaped like a parallelogram and is also very angular. 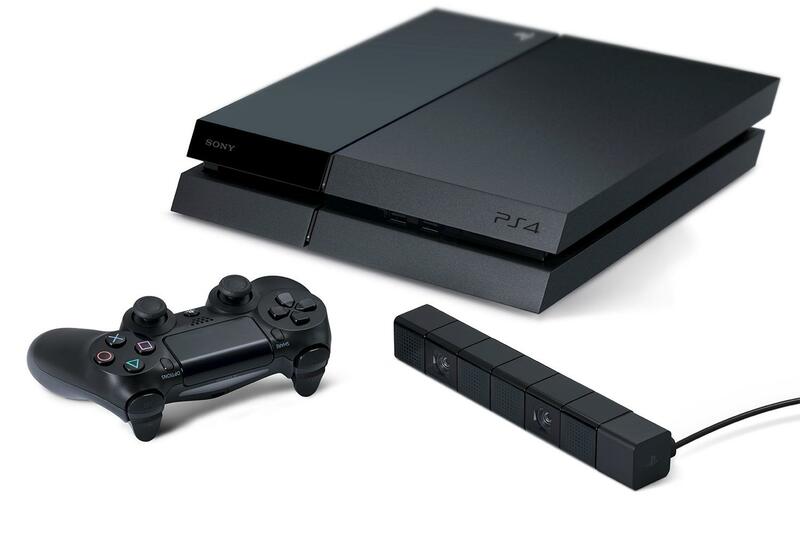 The plus to the PS4 is that its isnt as Big and bulky but still ugly IMO. As of right now this is an easy choice. 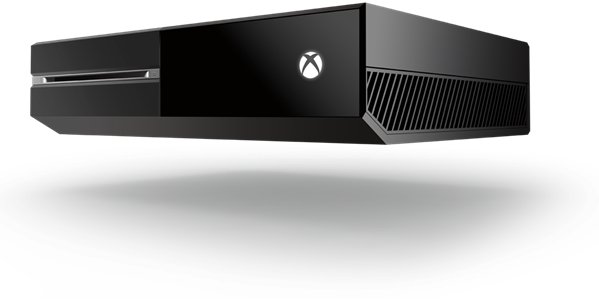 The Xbox One is aiming to be bigger than just a gaming device and as it stands now its the all in "One" device. Just think of the Xbox 360 (and all of its integrated services like Netflix, Fios, Xfinity, Hulu+, YouTube, ESPN ect.) which IMO was already an all in one device and multiply that by like 3x. Also though controversial (the Kinect Must be connected to the Xbox One at all times or the console wont function.) it comes with a Kinect 2 so which opens the it up to a whole new world of voice an gesture commands. Sony is still playing catch up but they aren't that far off. 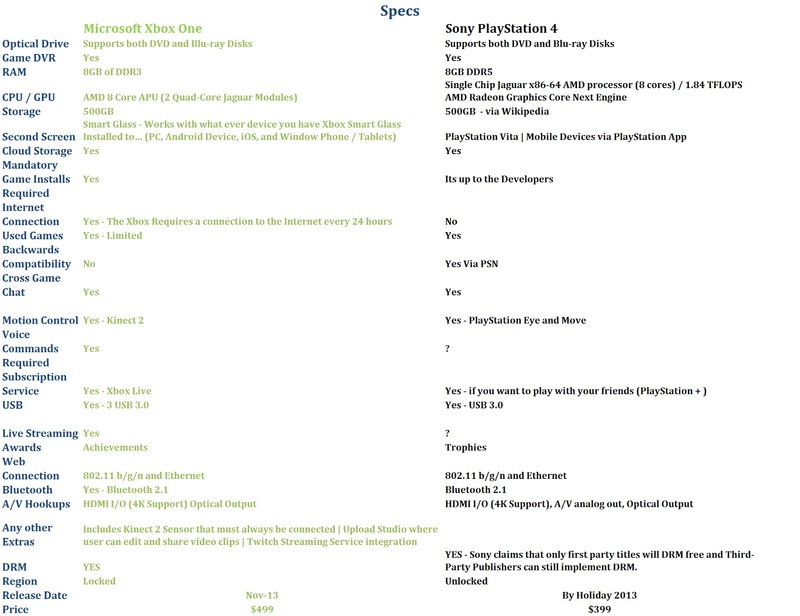 Where Sony does have 1up on Microsoft I with Backwards compatibility via the PSN. Microsoft already said that the only thing you transfer from you 360 is you Gamertag and Gamerscore and you want to play your Xbox 360 games keep your 360. This one is hard to call to be honest because most of the good games that we seen were multiplatform so there really no advantages given by most of the blockbuster titles (Metal Gear Solid V, Watch Dogs, Assassin's Creed: Black Flag, Call of Duty: Ghosts, The Elder Scrolls: Online, Destiny, Final Fantasy: VERSUS XIII/ XV, Kingdom Hearts III, etc.) When it comes down to it Microsoft flat out had more Exclusives for the Xbox one.. Winner: Wii-U lol nah it goes to the Xbox One though if the wii-U was in this comparison it would have being that i was excited for their games the most. Obviously the PS4 is going to win this but when you look at it they systems would probably be the same price if the Xbox One didn't Require the Kinect 2 sensor, then it wouldn't be packaged in with it. You can also look at it as if the PS4 bundled the PlayStation Eye it would be around the same price or at least close to it. The PlayStation 4's launch is still months in the future so who's to say they wont sell a SKU with one bundled. Just to get this out of the way I will eventually purchase both systems (Seriously I'm a fan boy of gaming in general I try not the lean either way without a logical reason but if a billion dollar company shits on the consumer you should be ready to fire back. ). I been leaning towards the PS4 mainly because the negative backlash due to Microsoft's policies and strange behavior by their PR and Executives. Then during the PS4 they announced Final Fantasy: VERSUS XIII/ and Kingdom Hearts III and I was sold that The PS4 would be my next console. Now 2 days later after doing some research a few things changed. One being that the games from Square Enix won't be Exclusives for the PS4 but will also be available for the Xbox One. Next, that I come across an article that to play online for the PS4 wont be free, in other words PlayStation Plus will be required to play with friends on PS4 but not PS3 WTF? Yeah bad move IMO Sony... If that not bad enough Sony is going to let Publishers control DRM.. So wait the they are doing the same as Microsoft? Well not exactly Sony wont implement DRM in their first party games (What ever that is worth)... Some of Microsoft policies still bother me like DRM and it will always bother me being that I borrow out games a lot and give some away to friends and family. Always connected Kinect will always be a problem for me as in i don't think there should be a very capable spy camera watching in my living room specially after all the news as of late. I don't care or rather don't like the direction that both systems are taking with backwards compatibility, but at least the PS4 is taking measure to make games available on PSN. I hate to give a crappy answer but the decision is up to you. both systems have their pros, cons, and secrets that are still unraveling. Check out they side bar for more e3 news and if more info and/or corrections message me or comment.